When in Dublin, you’re sure to please your palate. With more than 100 restaurants, you&apos;ll leave Dublin with a full stomach and a smile on your face. Grab a locally-sourced pizza pie from Harvest Pizza or stop by the Pint Room where you can find an assortment of beers to cheers. Venture through Whole Foods Market and get lost finding your favorite cheese, wine or delicious dessert. Brunch at Sunny Street Café or enjoy breakfast cocktails at Napa Kitchen + Bar. The dining options are endless here, and we hope you’ll stay and sample them all. Have you ever heard of an Irish Egg Roll, Shamrock Sundae, or a Triple Irish Brownie? If not, then you haven’t been to Dublin’s Irish Approved Businesses that serve up Irish-inspired products and services year-round. Pair some Irish fare with a packed schedule of Irish experiences for the perfect match. An Irish experience can range from live Irish dancers at your favorite Dublin event, to a Celtic rock band on the patio of a neighborhood pub. You can’t visit Dublin without grabbing a Guinness at one of our Irish Pubs. In Downtown Dublin, you’ll find three of Dublin’s favorites. Grab a snug at the Brazenhead, inspired by the oldest pub in Dublin, Ireland. Not only will you find beer imported from Ireland, but you’ll also find the bar itself was imported directly from the Emerald Isle. Enjoy live Irish music on the patio while munching on Guinness beer-battered fish and chips. 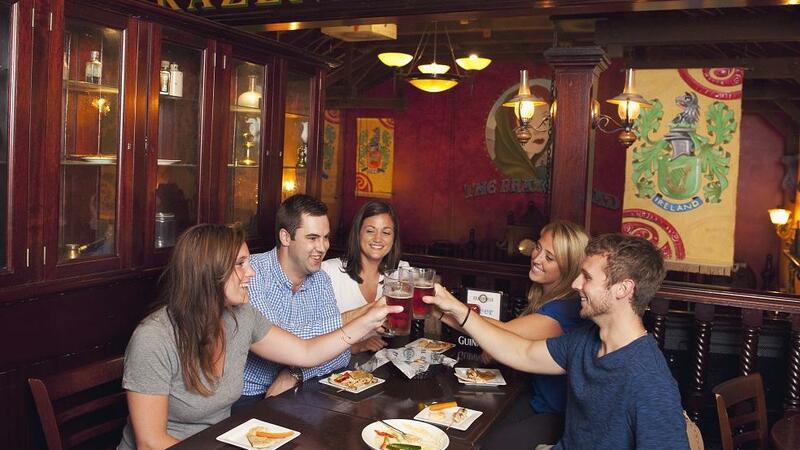 Visit the Dublin Village Tavern for a friendly atmosphere filled with the aroma of Irish attitude. The DVT offers an Irish Kettle Dinner, Braised Beef Shepherd’s Pie and more than 30 different kinds of Irish whiskey. Fado Pub and Kitchen combines the fun, energy and connection of an Irish pub with a kitchen that passionately serves fresh, European-inspired food. Wander the street of Downtown Dublin where historic meets hip and quaint and cool share common ground. Stop in Mezzo Italian where you can sample old world tradition mixed with new world cuisine. Relax on Tucci’s picturesque patio while enjoying hand-cut steaks or seafood and a world class wine list. Head to Bridge Park to sample a beer made at the RAM Brewery, or enjoy classic entree in the retro-themed Cap City Fine Diner. Take in rooftop view at VASO while enjoying Spanish-inspired tapas or fill up on some upscale southern comfort food at Hen Quarter. With more than 25 eateries in this walkable area, we hope you’ll come hungry. Sweeten your trip to Dublin with a stroll to one of our handmade sweet shops. Be greeted at Winan’s Fine Chocolates and Coffee and indulge in homemade buckeyes and signature coffee blends. Watch as chocolate, fudge, caramel corn and candy apples are made right in front of you at Kilwins. Pop into Our Cupcakery for a gourmet cupcake or build your own on site. Don’t leave without an Irish Approved Shamrock Sundae from Graeter’s Ice Cream or a scoop of one of Johnson&apos;s Handmade Ice Cream made right here in Central Ohio.